kevinrose Just walked into the bar with this dog (see earlier vid), holy hell, 5 girls came up in 2 mins. This dog is gold! I’m still up in the air about Twitter. I like it, but I’m feeling unfulfilled. Maybe I don’t know how to use it correctly. It would work a whole lot better if “twits” updated in real time and the whole thing operated outside the browser. Here are some random “twits” I enjoyed… and the raison d’être I come back. Kevin Rose kevinrose Just walked into the bar with this dog (see earlier vid), holy hell, 5 girls came up in 2 mins. This dog is gold! LanceUlanoff Curse you Brett Myers! mattcutts Duncan Riley is auctioning his original Google Chrome comic book: http://bit.ly/ebaychrome . mattizcoop Chilling with the boy, regretting the 5:55 AM flight out of MSP, bumming out that Heart put the kibosh on use of “Barracuda” for Sarahcuda. HowardKurtz So many media folks on this plane, hope the Repubs dont launch an elite-seeking missile. Kirk Varner kirkv Anyone want to wager that these are the last political party conventions that ABC/CBS/NBC give up any primetime for? geofffox Mixed emotions hoping winds/rain are heavy enough to justify my forecast, light enough not to injure. Always forecast with conscience. The world summarized in 140 characters or less! Dan Desjardins, from Weather Central in Madison, WI, called me. He was worried, because word was out I’d been fired! Though this story starts back in May, I didn’t even know there was a story until yesterday. Dan Desjardins, from Weather Central in Madison, WI, called me. He was worried, because word was out I’d been fired! Had they called and asked, or sent an email? No. It’s not like I’m that difficult to find. I went to see my boss. “Uh, Kirk, have I been fired, but no one’s told me yet,” I asked? He smiled… but it was a good smile. Truth is, back in the early 70s I received a call from my friend Bob Lacey. He’d heard I’d been fired from my job in Cleveland. Only, it didn’t happen until the next day! That was a pretty crappy day. So, how does this happen? In this case tvjobs probably took a shortcut when they saw WTNH’s website change. 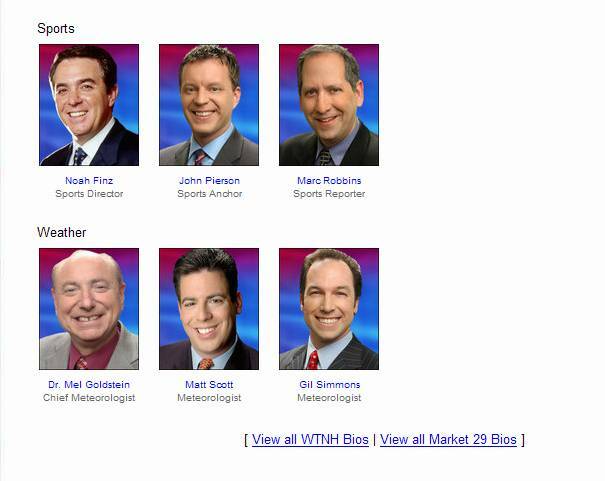 For some odd reason, my picture disappeared from its page with the other meteorologists. Our webmaster, Jeff Bailey, said, “Looks to me like it was accidently archived at the end of May.” As big an ego as I have, I don’t look to see my picture on the station’s website. Who knew? My boss, Kirk Varner, fired off an email. Assuming you are not referring to Mr. Fox’s recreation choices, this information is incorrect and needs to be updated immediately. Mr. Fox is still in the employ of WTNH as he has been in the last 24 years, and a simple check with his employer (that would be me) would have verified this information in less than five minutes. As I can find no press or internet posting suggesting that Mr. Fox’s employment status has recently changed, perhaps you could also enlighten us as to the source of your information as part of your apology and retraction to both Mr. Fox and this station? As far as I know, Kirk hasn’t heard back. However, as of today tvjobs requires readers to click through an advisory. Dan, who first brought this to my attention, found this change today. “Now they make you click on a disclaimer about “on the beach” listings before you can look at them. They “clarified” that on-the-beach means the individual has “dropped off the stations web site” And, they’ve changed the text with my photo. I’ll let you know when my apology arrives. Don’t stay up. As I checked the mail this morning, one of the first things I read was from my boss, Kirk Varner. It was clear, early on, that Friday had a significant chance for severe weather. I was concerned that the computer models downplayed it somewhat. But Thursday, within a few hours of being run, they had already blown the forecast in Michigan… so the computers weren’t to be totally trusted. A little activity started on Central New York State toward early afternoon and the Storm Prediction Center threw up a Severe Thunderstorm Watch for the entire state, effective until 8:00 PM. A little background. I forecast the weather. The folks I work with forecast the weather. My competitors forecast the weather. But, we all leave watches and warnings to the Weather Service. The idea is to present a coordinated front, so as not to be confusing. In my 20+ years in weather I have heard few dissent from this concept. After a watch is posted, it is the job of the Taunton, MA National Weather Service Office to put out a ‘redefining’ statement for all of Connecticut (even though they normally only forecast for 3 of the 4 northern counties and none of the shoreline). These are needed because watches are parallelograms and they don’t evenly fit within state or county borders. Without the redefinition, a watch area might include a small sliver of a state or something else equally confusing. Taunton’s original statement only included their counties. Then a correction to include the whole state. SEVERE THUNDERSTORM WATCH NUMBER 880 IN EFFECT UNTIL 800 PM EDT. But, by then the damage had been done. At the TV station our Weather Warn II computer was confused. It put up a Thunderstorm Watch and then alternated text for a “defined area” and mentioned the three original counties. If we would have aired it, it would have looked like the watch was only for three counties. As I drove in, Kirk Varner, our news director (who reads this, I can’t blast him here), saw what was going on and basically shifted to manual. This system is supposed to work on its own, without intervention. At the moment, it can’t be trusted. But, thankfully, we had the right info on the screen. Throughout the afternoon we saw scattered thunderstorms. They probably didn’t get to the ‘official’ severe limit, but were close enough to justify the watch box. Tonight, the system again died down. And then a series of awful human judgment errors. THREAT OF SEVERE WEATHER HAS ENDED. THE SEVERE THUNDERSTORM WATCH CONTINUES UNTIL 8 PM FOR RHODE ISLAND. But, the threat hadn’t ended. All of a sudden, in Southern Windham County, the storms fired up rapidly and ferociously. SEVERE THUNDERSTORM OVER PLAINFIELD…MOVING EAST AT 25 MPH. WEST GREENWICH AROUND 815 PM. But, in Connecticut, these storms weren’t just over Windham County. They had crossed the border to New London County. In fact, by the time the warning went up, Northern New London County was seeing more action than Windham. Windham County gets its warnings from Taunton, MA. New London County gets them from Upton, NY. No warning went up for New London County. If there was reason for warning Windham County, there was reason for a warning to be issued for New London. This lack of coordination is a problem we face a few times a year, at the least. At 7:51 PM, the watch and warning configuration in Connecticut was out of whack with what was actually happening. This system is supposed prepare and inform. It was confusing. Thunderstorms continued, though weaker, until sometime past 10:00. Saturday will be a totally different weather animal – cooler and fresher. I am not happy with what went on Friday. In many ways, I am powerless to change things unless I start ‘buying out’ of the unified watch and warning scenario. I don’t think I’m ready for that… but I’m close. By the way, at 4:21 PM the dew point a Meriden, CT (KMMK) reached an unbelievable 79°! I can’t ever remember seeing a dew point that high in Connecticut.